Nothing says "strong, proud club" like a strong, proud domain name, and we let you bring your club domain name to the Majestri party. It's a pretty simple exercise and it sounds much harder than it really is. I'll do my best to explain some technical concepts as simply as possible, so push aside those fears, and let's delve into the inner machinations of the Internet and establish your club identity. If your club already has a domain name, just skip to the next section. There are plenty of places to buy a domain name on the Internet. One that we use regularly for all of our domain-purchasing needs is Ziphosting. We have no affiliation with them, nor do we get kickbacks for pointing people there. We just find the price is pretty good. There's always a bit of confusion as to whether to go the .com or .org, or the .com.au or the .org.au. In our humble opinion, a registered Australian Not-For-Profit organisation always looks great with the .org.au. With either of the .au options, you will need an ABN to purchase the domain name. Sometimes we get asked whether we will acquire the domain name on behalf of clubs. Your club domain name transcends Majestri. If you ever decided to switch services away from us (hopefully unlikely), then you'd need to have full control over the domain name. Anyway, get that all sorted, and during the checkout process, you'll be asked what type of hosting you'd like to sign up for. Make sure you do not include "Web Hosting" as a plan component. Majestri does this part for you. Email is optional, but you will definitely need "DNS Hosting" if it is an optional component - some providers give it to you automatically, where some others just automatically bundle it is as part of the domain name. Wherever you bought your domain, you should have been issued a username and password for that domain upon purchase. You should also have been given a link to a web-based site by your domain name registrar that allows you to log in with that username/password combination and enter a console that gives you control over every aspect of your domain. You need to be at this point in order to proceed. You're going to be changing the DNS settings for your domain name, so if you have anybody technical at the club who can assist, you may want to ask them to get involved. 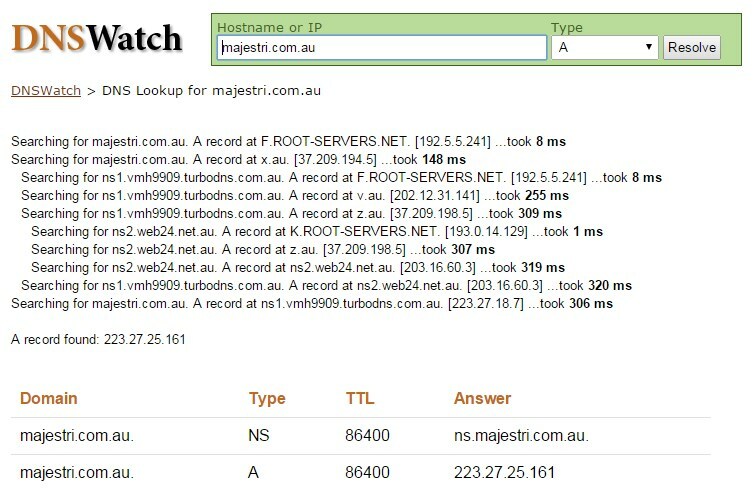 Alternatively, if you don't feel comfortable with doing this part, and you're comfortable sharing your domain name credentials with us, then you can send an email to support@majestri.com.au and we'll be happy to do it for you. If you're going to be doing it yourself, then you still need to send us an email to let us know that you're about to make the change. We need to set things up on our end so that we can host your domain name as part of our service. There are two entries that need to exist in the DNS zone file. They may already be present and just need updating, or you may need to create them. Essentially, these two settings just tell the Internet where your club website will now be located, and to also ensure that a "www." prefix used by your members will still get to the right website. Now when you change those settings, the Internet takes a little while to catch up. Heaps of machines all around the globe need to be told that your club domain can now be found at a new place. The general rule of thumb is that it takes around 24 hours. During this time, you may open your browser and enter your club domain, and it still may not have updated. You start to doubt yourself and wonder if you entered it all correctly. You can tell we've been there before too, hey? After you've entered your club domain name on the first page and hit Resolve, you'll see a technical trace of the DNSWatch service finding where the domain name points. If the trace eventually comes across the Name Server information that you entered to point to Majestri, then, in the words of Dr. Nick Riviera, "the operation was a complete success."